The 2019 Masters is a tradition unlike any other. Cell phones are prohibited on the hallowed grounds of Augusta National Golf Club, giving the tournament a nostalgic feel. The majestic tree-lined course, rich with history, has seen legendary players like Tiger Woods, Arnold Palmer, Jack Nicklaus, Tom Watson, Nick Faldo, and Phil Mickelson come away with green jackets over the last 82 years. Patrick Reed and Sergio Garcia are the last two champions at Augusta, and they're both going off at 60-1 in the current 2019 Masters odds. Rory McIlroy is the favorite at 8-1 in the latest Masters Tournament odds and can complete the career grand slam with a win this week. 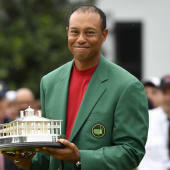 Meanwhile, Woods has won the grand slam three times over and he's 12-1 to win it all at Augusta, among the top 2019 Masters contenders. The first 2019 Masters tee times are on Thursday at 8:30 a.m. ET, so amateur and professional bettors alike are running out of time to enter their picks on the 87-player field. Before you make your 2019 Masters picks and PGA predictions, see the projected leaderboard from the model at SportsLine. SportsLine's prediction model, built by DFS pro Mike McClure, has nailed four of the past eight majors entering the weekend, including Patrick Reed's groundbreaking Masters win last year. It also called Tiger Woods' deep run in last year's PGA Championship despite being a 25-1 long shot. The model has been spot-on early in the 2018-19 PGA Tour season. It was high on champion Dustin Johnson at the 2019 WGC-Mexico Championship, projecting him as one of the top two contenders from the start. It also correctly predicted Brooks Koepka's (9-1) victory at the CJ Cup earlier this season. Additionally, it correctly called Bryson DeChambeau's (9-1) seven-shot victory at the 2019 Omega Dubai Desert Classic. Anyone who has followed the model is up huge. Now that the 2019 Masters field is locked, SportsLine simulated the event 10,000 times, and the results were surprising. One huge shocker the model is calling for: Woods, a four-time champion and one of the top Vegas favorites, doesn't even crack the top 10. Woods, a 14-time major champion, won the first major of his career at Augusta National in 1997 and has 13 top-10 finishes at the Masters in 19 appearances as a professional. However, he recently had to withdraw from the Arnold Palmer Invitational, an event he has won eight times, due to a neck strain. And with Woods' long list of injuries in recent years, the model doesn't believe he'll even come close to his fifth green jacket. Plus, Woods' last victory at Augusta National came all the way back in 2005. He also currently ranks 72nd on tour in driving accuracy (64.29 percent), which could cause major trouble at Augusta National, where the fairways are extremely tight and lined with trees. He's not a strong pick to win it all and there are far better values in this loaded field than the 14-1 premium he's commanding. Another surprise at the Masters 2019: Bryson DeChambeau, a 25-1 long shot, makes a strong run at the title. He's a target for anyone looking for a huge payday. DeChambeau is making his third career start at the Masters this week. The 25-year-old finished 21st in his first start at Augusta and followed that up with a 38th-place showing last year. Despite his 2018 result, DeChambeau has made strong strides in his game. In fact, he's won four PGA Tour events in the last year, which includes two victories in the FedEx Cup Playoffs. And he's shot even par or better in five of his eight rounds at Augusta National. Also, the model says three other golfers with 2019 Masters odds of 20-1 or longer will make a strong run at the green jacket. Anyone who backs these underdogs could hit it big. So who wins the 2019 Masters? And which long shots stun the golfing world? Check out the 2019 Masters odds below and visit SportsLine now to see the 2019 Masters projected leaderboard from the model that nailed the winners of four golf majors.